Members have access to regular technical updates via Sweeping: The Journal of Chimney & Venting Technology. NCSG is the only nationally-recognized trade association for chimney professionals. Affiliation is easily verifiable online with NCSG's Find a Member locator. Hire an NCSG member and hire a leader in the industry! 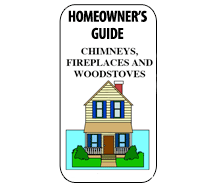 Click the image above to download the Homeowner's Guide to Chimneys, Fireplaces and Woodstoves e-book. Our thanks to the authors, Jim Brewer of Magic Sweep Corporation and Ashley Eldridge, for allowing us to share this inforamtion on our site.